Mega muscle pump during training! 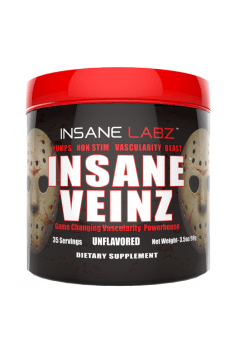 Insane Labs Insane Veinz is a pre-workout aliment containing substances that stimulate the synthesis of nitric oxide. This formulation increases the training capabilities through increased blood flow and nutrients transport to the muscle cells. The supplement effectively increases the exercise capacity of the organism, allowing for the conduction of more intensive training. It can also be used after workout in order to accelerate the regeneration processes. What is important, the composition of this formulation is not based on the stimulants. Beside the patented INSANE VEINZTM mix, the producer also added in the composition two important, form maintaining the hydro-electrolyte management point of view, elements: sodium and chlorine. Because of that one is able not only to transport the oxygen and nutrients through blood vessels better, but also to grant proper hydration level of the cells, which has a positive influence on the training possibilities. Sodium and chlorine are two crucial elements, necessary for the maintenance of hydro-electrolyte management and optimal pH. Both elements are responsible for delivering water to the cells, regulate osmotic pressure and are essential for the proper functioning of the organism. Physically active people, due to the increased loss of the elements with the sweat, should particularly take care of the electrolyte level, since they also participate in the muscle contractions. Appropriate sodium chloride level is indispensable in the transportation and absorption of nutrients in the cells. It is also necessary for the proper absorption of glucose in the muscles. High level of cell hydration is essential for the proper regeneration and anabolic processes. Water is transported along with the amino acids, necessary to rebuild the muscles damaged after the training, and high level of muscle hydration is responsible for their full look and filling effect. Nitric oxide (NO) plays a vital role in the organism. This biologically active compound relaxes the smooth muscles that surround the blood vessels, increasing therefore their diameter. Vasodilatation (specialist name of this process) is welcomed during physical activity when oxygen and nutrients need to be delivered to the muscles. Because of this enhanced oxygen supply the lactic acid level in the muscles is decreased, which is responsible for the fatigue and muscle burn. Agmatine is a naturally occurring biogenic amine which is created as a result of decarboxylation of L-Arginine amino acid, however it is more effective in action. Agmatine is more bioavailable and moreover, it positively influences the regulation of the enzyme responsible for the synthesis of nitric oxide. The research indicates a positive influence of agmatine on the production of growth hormone (GH) and luteinizing hormone (LH), which may have a beneficial effect on the general body composition and fatless muscle tissue. Agmatine crosses the blood brain barrier in an efficient way, where it has neuromodulating and neuroprotective effects, improving the mood and increasing the cognitive capabilities of the brain (it is used as an antidepressant). Anhydrous betaine is a methyl derivative of glycine, which participates in the transformation o homocysteine into methionine. It is present in the food and produced by the organism in the liver or kidneys. It has osmoregulative properties, helping to sustain proper kidney hydration and providing them with sufficient level of nutrients. In the research an increased consumption of oxygen and the ability to perform larger training volume have been noticed when taking betaine. In one of the research it has been observed that the group of people taking betaine had increased level of insulin resistant growth agent (IGF-1), which is a powerful anabolic hormone. Beet extract containing of 1% nitrates - nitrates are a natural component found most abundantly in beets, but their considerable amounts also occur in radishes, spinach or rocket. Nitrates are transformed into nitrites, which in turn are converted to NO. Our organism can use nitrates as a reserve to create NO - upon the lack oxygen, the appropriate enzymes will convert nitrates to nitric oxide. Tarragon (Artemisia dracunculus L.) is a plant originating from North America, used as a spice (often a component of Provencal herbs) and containing large amounts of vitamins and minerals. In medicine, it was used as an anti-inflammatory agent, improving digestion, and also improving insulin sensitivity. Tarragon has properties that support blood circulation, which helps in the distribution of oxygen, enzymes, nutrients and hormones in the organism. In addition, studies of estragon extract show that certain compounds contained in it inhibit the activation of platelets, preventing platelet aggregation and adhesion to the wall of the blood vessel. Tarragon, allowing proper blood circulation, ensures that the blood vessels are unobstructed and do not create dangerous deposits. To sum up, Insane Labs Insane Veinz is a comprehensive formulation ensuring proper hydration level of the cell and increase of the diameter of blood vessels, without stimulants. The substances contained in it increase the nitric oxide level, improve blood circulation and sustain appropriate hydration level of the cells. This formulation increases the exercise and regeneration capacities in an effective way; shows anabolic potential. 1 scoop (2,8 g) mix with 200ml of water and drink 30 minutes before training. The preparation provides an effective muscle pump and filling effect. There are very few stimulants-free supplements supporting the process of vasodilation and hydration of cells in such a comprehensive way. The product is especially recommended to people taking a break from the substances stimulating the nervous system or people hypersensitive to their activity, in particular, caffeine. The product is ideally suited for use in the evening – due to its stimulants-free content, the supplement does not hinder falling asleep and does not disturb the circadian rhythm, and at the same time effectively stimulates physical capabilities.